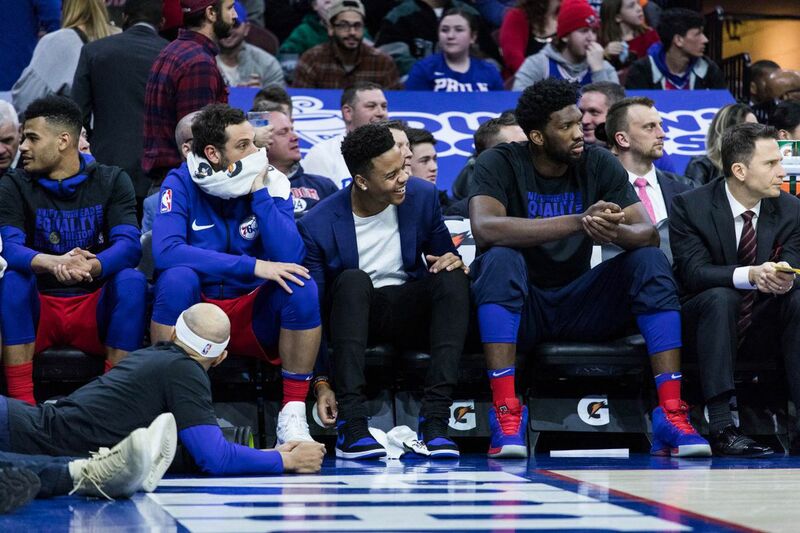 Sixers guard Markelle Fultz sitting on the bench between teammates Marco Belinelli (left), Joel Embiid (right) during the second half of the Sixers’ victory over the Heat at the Wells Fargo Center on Wednesday. As they do at every practice, the 76ers' media-relations staffers took a moment Wednesday morning, during the waning minutes of a pre-game shootaround, to hand out copies of the team's official medical update. The descriptions of the ailments and injuries, though, weren't entirely accurate. There were five players on the list, and the third, between Joel Embiid (right ankle soreness) and Demetrius Jackson (left adductor strain), was Markelle Fultz. "Right shoulder rehabilitation," the report said. "He is out." Anyone who has followed the strange, confusing story of Fultz's health and availability should have recognized the inaccuracy right away. The Sixers announced in early December that Fultz was no longer experiencing soreness or pain in his shoulder, and they announced on Jan. 2 that he had been cleared to train and practice with the team. So presumably, there's nothing more for him to rehabilitate – not in his right shoulder, at least. No, what needs treatment now is Fultz's mind, and the Sixers' misleading press release is merely the latest example of their failure to confront the reality and severity of this situation. From giving garbled, evasive explanations for Fultz's absence to providing the media with post-practice peeks at his awkward layups and ugly jump shots, the Sixers have handled this problem as poorly as possible. From the beginning, they've approached it as if saving face were more important than saving Fultz's career. Understand: That's what is at stake here. Fultz entered last year's NBA draft as the consensus No. 1 pick, a supple 6-foot-4 combo guard from the University of Washington who appeared so ideal a fit for the Sixers that they traded two first-round picks to a rival, the Boston Celtics, for the chance to select him. But it has become an open secret around the Sixers and the NBA that Fultz has lost the ability to shoot a basketball with any confidence or competence, that he has a similar mental block to those that plagued Steve Sax, Chuck Knoblauch, and Mackey Sasser when they had to throw a baseball. It's a more intangible affliction than a torn meniscus in Embiid's knee or a broken bone in Ben Simmons' foot or even the mysterious "scapular muscle imbalance" in Fultz's shoulder that might have triggered this extended psychological episode, but it's potentially more debilitating. Most physical injuries have relatively predictable time lines for healing and recovery. There's no telling when Fultz will find his way back from this, and there's no guarantee that he will. Ben Hogan saw his reign as the country's greatest golfer truncated because of the putting yips, and Steve Blass was a reliably excellent starting pitcher until his bugaboo blinded him to the strike zone. And both those men were more established and secure in their careers and lives than Fultz, a 19-year-old rookie, is in his. "What every player does when they have an injury, surgery, or problem is say, 'Oh, my God. I hope this won't screw me up,' " said Richard Crowley, a sports psychologist who has treated several athletes for this condition, including Sax. "But fear goes in them, and the fear is still operating like a computer chip, sending out angst. "When they're about to swing, hit, shoot the basketball, whatever, there is that thought: Don't screw it up. Don't make a mistake. Now, if I tell you, 'Don't think of pink elephants,' what happens? The mind doesn't process the word don't." So what should a franchise do to help a player in such straits? Should it expose him to the prying eyes – and iPhone cameras – of media members? Should it have its general manager pussyfoot around the crux of the matter during an uncomfortable, euphemism-laden session with reporters, as Bryan Colangelo did last week? Should it just close its eyes and plug its ears and hope Fultz snaps out of it? "That would be insane," Crowley said in a phone interview. "It has to be, 'We have a problem. The whole world knows it. It's a given.' "
Well, color the Sixers crazy, then. For a while now, they've shown a tendency to start selling their potion before they've perfected the formula, to put the presumption of greatness ahead of the substance of advancement and achievement, and they've done the same thing with Fultz. They had him shooting free throws at the Wells Fargo Center on Wednesday night before a game against the Miami Heat, inviting fans to gape and raise their expectations about when he might return. He was supposed to be the perfect third budding superstar, joining Embiid and Simmons at the core of a future championship contender, so essential that the Sixers couldn't risk that the Celtics would draft him first. Now, based on the slivers of insights he provides, he seems lost, frustrated. No wonder. He bristled when ESPN quoted coach Brett Brown as saying that Fultz was dealing with "psychosomatic effects," and perhaps Fultz is willing to be the object of derision and odd fascination because he doesn't want to look soft. But he is also a teenager. He's not the expert. He's not supposed to be calling the shots. Yet after a four-year span in which four first-round picks – Nerlens Noel, Embiid, Jahlil Okafor, Simmons – missed all or much of their rookie seasons, the Sixers seem more concerned about protecting their image than they do their prized prospect. Instead of doing what's best for Fultz – explaining everything honestly and clearly, shutting him down for the season, shutting him off from the public, and focusing singularly on his well-being – they seem more concerned with stalling, in the hope that people will stop paying attention. In the same breath, Colangelo told reporters that Fultz could play soon but might not play again this season. Fultz tweets but says nothing else publicly. A team spokesman said Wednesday that the Sixers declined to comment or to make Colangelo available again. So there's no way of knowing the answer to an essential question: Who's overseeing Fultz's rehab? Who's in charge? Is it Daniel Medina, the recently hired vice president of athlete care? Is it one of the other six MDs listed on the Sixers staff? Is it sports psychologist Joel Fish? Is it one of the 11 other people on their payroll, from Brown to his four assistant coaches to their "director of performance science," who on the basis of their job titles could theoretically be involved? What about Keith Williams, Fultz's trainer, mentor, and confidant? How many voices are in this kid's ear, and which ones should he listen to? Somehow, the Sixers were more proactive and transparent when Sam Hinkie was stone silent. There's been plenty of sleuthing and subtle finger-pointing and buck-passing over who deserves blame here. Did Fultz change his shot over the summer? If so, why, and who suggested he do so? Was it the Sixers? Was it Williams? Was it Fultz's own idea? Those details are interesting but, at this point, irrelevant. Here's what matters now: The No. 1 pick in the draft, a player the Sixers surrendered significant assets to acquire, appears in the midst of a mental and emotional crisis. The Sixers cannot avoid it. They should no longer elide it. And it's past time for them to do all they can to solve it.